Some galleries in Vermont are known for showcasing innovative work by contemporary artists. But a current show at the historic Shelburne Museum demonstrates that some Vermont designers were edgy 200 years ago. Jean Burks, the museum's recently retired senior curator, has assembled an eye-opening exhibit of about 50 pieces of furniture made in Vermont during the first half of the 19th century. While some of the items on display in the Pizzagalli Center for Art and Education conform to preconceptions of staid and sturdy Yankee craftsmanship, many might startle visitors with their colorful, exuberant styling. Indeed, a few pieces are so baroque, they look as though their makers didn't know when to stop. These ornate bureaus and tables might not appeal to a viewer with conservative taste, but they'll surely bring a smile to all but the crustiest observer. Visitors already interested in vintage Vermont furniture, or design generally, will find this an enriching, even thrilling exhibit. Those with little knowledge of this particular decorative arts genre can learn a lot, even if some of the pieces seem similar and the amount of information feels a bit staggering. 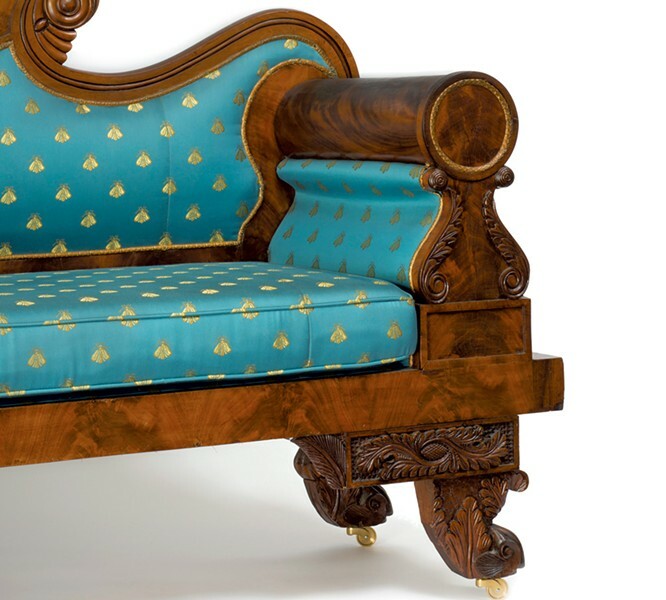 "Rich and Tasty: Vermont Furniture to 1850" opens with one of its stateliest objects: a Greek Revival sofa made in Middlebury around 1830. Its blue upholstery, framed with stamped brass, features a pattern of airborne bees. A delightfully quirky piece is situated close by. A pair of drawers, each with two pulls, rests atop the elongated stem and wheeled base of this brightly finished stand, which looks like a four-eyed version of the extraterrestrial E.T. This idiosyncratic, expertly crafted piece was made by Nathan Burnell in Milton in 1853, but not every object in the show is so firmly attributed and dated. In fact, some designers and builders are unknown. Burnell made sure to inscribe the stand with his name and its year of execution. He also listed it — in his elegant handwriting — in a leather-bound ledger that's on display. Perhaps due to the stand's curiosity value, it ranks as one of the most expensive items in Burnell's accounting book, which records its sale to Daniel Onion for $35. 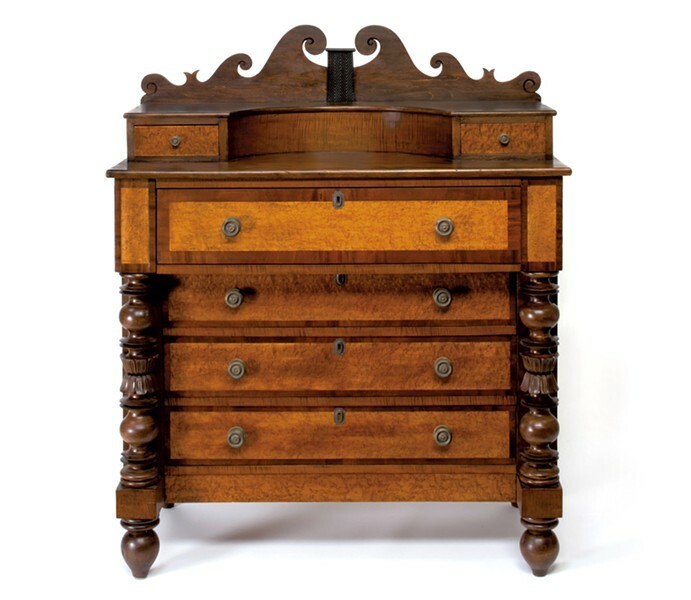 A desk made in Londonderry in 1852 is another likably odd piece. The front of its drawers have been carved and painted, trompe l'oeil style, to resemble book spines. Perhaps a local bibliophile commissioned the cleverly inventive desk. And don't overlook the base of a decorative sideboard made in Randolph in 1829, with toenails — or possibly claws — carved into its feet. 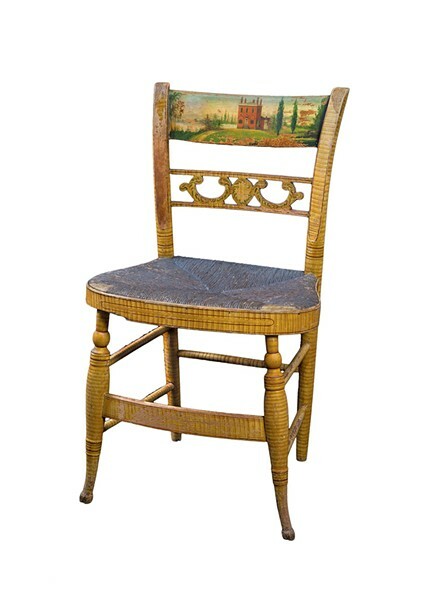 A fancy chair built in 1822 propitiously features on its backrest a painted view of a building at the University of Vermont that, two years later, was destroyed by fire. The warm colors and lighthearted design of a number of the pieces may seem surprising products of a state in which, in the 19th century, mostly rural residents lived hardscrabble lives. Burks says she was "stunned" by not only the "wildly veneered" objects she located and borrowed for the show, but also by the sophistication of their forms. "I was blown away by the beauty and by how much it was influenced by urban style centers," she said in an interview. Many of the 1,000 or so Vermont furniture makers of the preindustrial era were aware of what was considered chic in Boston and New York. In some cases, the styles they emulated had originated an ocean away from remote Vermont. A text panel accompanying a lovely bow-front bureau made in Norwich around 1815 notes that it was inspired by a Louis XV design imported to Boston from Paris. Burks presents visitors with background information for every item in the show. But none of the extensive commentaries explains the "Rich and Tasty" title. It's revealed in an introductory essay in the show's impressively large catalog. 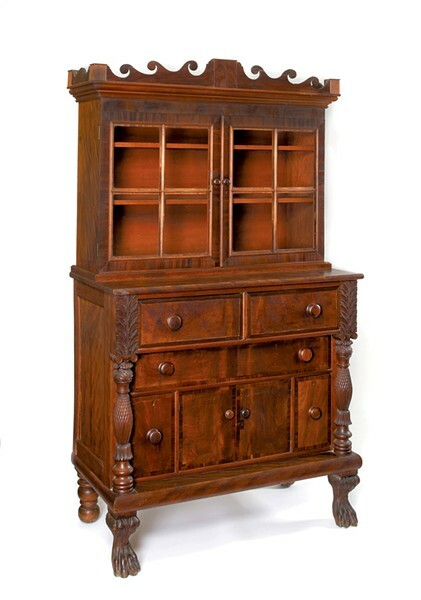 Philip Zea, president of the Historic Deerfield site in Massachusetts, quotes the June 2, 1829, edition of the Vermont Gazette, explaining that Bennington cabinetmaker Hastings Kendrick was moving to a Main Street shop where he intended to manufacture "a variety of rich and tasty furniture from the best materials and in the best manner." The inspiration for Burks' farewell show lies in a 1995 exhibit organized by the Bennington Museum and presented at the Shelburne. Burks, who was then curator of decorative arts, considered that first-ever exhibit of early Vermont furniture revelatory. She said she expected the pieces might resemble the austere Shaker designs that were her academic specialty. Instead, she found the Vermont look uniquely exuberant for its time and region. It took Burks 20 years to locate additional pieces from that era and to identify many of their makers. Most of the works included in "Rich and Tasty" are on loan from four private collections, she notes. Only a couple also appeared in the 1995 show, and just five of the 50 pieces currently on display come from the Shelburne's permanent collection. The contemporary Vermonters from whom Burks borrowed certain pieces generally did not treat them as precious antiques to be admired but never used. One lender, Burks recounts, joked about being reluctant to part with a bureau — even temporarily — because, he said, "Where else will I put my socks?" A few pieces do show wear. For example, the finish on the seat and comb-backed headrest of a 190-year-old rocking chair made in Shelburne Falls has been abraded over the generations. "Rich and Tasty" does not extend beyond 1850, Burks explains, because Vermont furniture generally ceased to be handmade after that point. "The industrial revolution brings mass production and makes the pieces less interesting and less unique," she says. But many Vermont artisans are again designing and building furniture by hand. Perhaps Burks can be persuaded to come out of retirement and organize a show of "rich and tasty" pieces from the 21st century. The original print version of this article was headlined "Home Goods"